On the occasion of sorrow and shock, after the death of His Excellence Michael Chilufya Sata in London on the 28 October, 2014. I would like to sincerely share a condolence message to the first family, comrades and patriotic citizens of the Republic of Zambia. A simple paragraph cannot ease the pain of the loss, but I hope the people of Zambia take solace in knowing that his brave services exceeded all measures of selflessness and devotion to his beloved country Zambia. Today, I honor him not only as a 'Man of Action', but as a true son of Africa and Zambia in particular, whose walk encouraged most of us not to give up on our dreams. And at this moment, I offer my heartfelt sympathy, and I pray that God's grace gives the First family and the people of Zambia comfort as you grieve. According to the constitution, states that the sitting vice president takes over the presidency upon the death or resignation of the incubment president. More to that, the vice president is given a transition period of 90 days to organise new election and the vice president is not barred from running in the elections. And according to article 38 states that, if the is vacancy of the Presidency due to the death of the incubment; the Vice President should immediately assume the office of the President and if the Vice President is unable for a reason to assume the office of the President, the Speaker should perform the executive functions, except the power to make appointments and dissolve parliament. I believe this article of the Zambian constitution was strengthened and clearly explained after the death of the Levy Mwanawasa in 2008 and it is at a time like this that article 38 will be exercised and observed meaning ceremonial Vice president Guy Scott takes over the presidency from acting President Edgar Lungu. Furthermore, I believe we now understand that it is the ceremonial Vice President who holds the responsibility of organising and hosting free and fair elections within 90 days of vacancy of the Presidency. Away from the constitution articles and protocol, I would want us to talk about the Zambia's magical number of 90days. In Zambia the 90 days is two faced and I will explain the two faces. The first face of the '90 days concept' that apppears before Zambian is the political propangada or strategy that was used in 2011 and never fulfilled to date. The 90 days propangada excited a lot of voters that believed in it very much until they were told that the 90 days was just a paper work strategy and did not exist in reality at all. And the other face of the 90 days that zambian remember is the continuity of development that Rupiah Banda to follow in Levy Mwanawasa's foot prints and this was characterised by politics of insults and corruption. Generally, 90 days in Zambia is a peroid of agony that is surrounded by unstability and undemocratic pathway to elections. It is also during this time that the loyalty of party members is tested because during this time new 'mushroom' political parties are formed without a fan base and also politic prostitution can be observed when senior members change parties in search of greener pastures which is now a common practice in Zambian politics. To put it in another way, the 'mushroom' political parties that enage during this period lack the necessary ingredient to be called a political party because in reality these parties are a one-man stand or in local language a 'Katemba' without any foundation or fan base to inspire a change. And this is mainly observed during the period of filing candidates for elections and according to my own analysis, 'mushroom'political parties dont even run for election, but end up endorsing other political parties' due to financial complications. It is during this 90 days that the Zambian economy is weak and the Kwacha is lower beyond redemption from the Central Bank of Zambia. And speaking, with a sense of history in mind, I believe the Kwacha has never fully recovered from the fall it experienced after the death of Levy Patrick Mwanawasa and the Rupiah Banda era and I know readers will conquer with me on this one. More to that, it can also be observed that during this period of agony state funds are embezzled and misused and evidence of this can be given by statistic check on how many government officials are undergoing or underwent abuse of office charges and trials all dating to the previous 90 days of agony. With the history of the 90 days of agony in mind, I believe the government through the Secretary to the Treasury and patriotic citizens have a big role to play to ensure economic stability and safeguarding of public resources during this transition period. And to discuss his legecy in public at the moment is an act of injustice I believe because African leadership is so different from other forms of leadership, in the sense that, the legecy of an African leader is mainly determined after a new leader is elected and begins to make errors thats when people begin to wish for the previos leader. Meanwhile in other parts of the world, a leader's legecy is determined the moment he passes away or when his term ends. 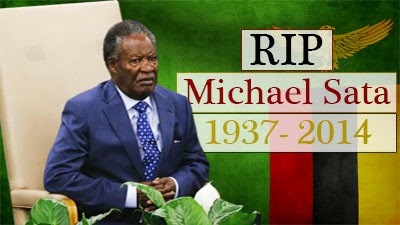 In conclusion, truth be told that Michael Chilufya Sata was the most popular Zambian President ever to be elected by a majority urban vote and eventhough, during his governance errors were made and as the acting president has announced the 14 days of mourning, I believe this is the time to reflect and celebrate Michael Sata's life in peace and unity.